Vanilla is so frequently used to flavor ice cream in Europe and North America that many people consider it to be the default ice cream flavor. The type of vanilla used as the ice cream flavoring may vary by location. There are different types of ice cream according to the flavoring used. Regular vanilla ice cream is flavored by natural vanilla extract. 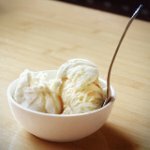 If the ice cream is flavored with vanilin from natural vanilla, it is referred to as vanilla flavored ice cream. If the ice cream is flavored with artificial vanilin, it is called artificially flavored vanilla ice cream. As vanilla is considered to be the plain ice cream flavor, vanilla ice cream is often used as the principal ingredient of ice cream desserts and cold coffee beverages. To celebrate National Vanilla Ice Cream, indulge yourself with several scoops of vanilla ice cream. You can top it with flavored syrup or sweet sauce, whipped cream, fruits, or sprinkles but it will taste delicious even without any toppings.